Hitachino Nest Session IPA is a 4.5% session IPA from Kiuchi Brewery, based in Naka, in Ibaraki, Japan. It’s part of their draft only range, and can be found in the Hitachino Nest taprooms in Akihabara and in Tokyo Station. Hitachino Nest Session IPA is brewed using exclusively Amarillo hops at the time of writing. 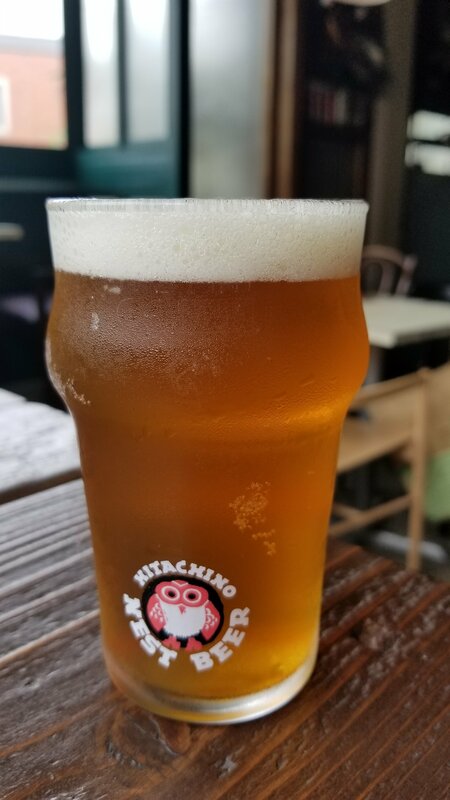 Hitachino Nest Session IPA came up a hazy orange brown colour with a plump white head on top. Hitachino Nest Session IPA reeked of Amarillo hops – and that’s not good. While the orange flavours came through, the wet cardboard aroma was not pleasant. Perhaps it was a bad harvest or the Amarillo hops had not been used properly, but that wet oxidised aroma was off putting. The body started off with an initial bitterness that worked well against the sweetness of the malts, but then a wet cardboard orange flavour came screaming through. Hitachino Nest Session IPA’s sweetness was its only saving grace and I begrudgingly drunk it – only because I had paid for it. I’m hoping this was a bad batch as this Hitachino Nest Session IPA was neither nice or drinkable.